ROLLING STONES 1st LP 1964 DECCA MONO '2.52' 1st Press!! AMAZING RARITY!!!! On offer here is one of the RAREST LPs you will EVER see (especially in this condition!!!!) by The Rolling Stones called "The Rolling Stones" and is an ORIGINAL1964 UKMONO 1st Pressing on the 1st PressUNBOXED 'Grooved' Decca label!!! !THIS LP IS SERIOUSLY RARE AND ALMOST IMPOSSIBLE TO FIND!!!! THIS WAS THE ROLLING STONES FIRST & RARESTLP EVER - AND VIRTUALLY NEVER TURNS UP FOR SALE!!!! JUST TRY AND FIND ANOTHER ONE!!!! IN FACT, THIS IS ONE OF THE MOST SOUGHT AFTER LPs OF ALL TIME - AND IS INCREDIBLY TOUGH TO LOCATE!!!! BUT WHAT MAKES THIS LP REALLY SPECIAL, IS THAT IT IS ONE OF THE 'EARLIEST' & RAREST 1ST PRESSINGS OF THIS LP EVER MADE - WITH A COMPLETELY DIFFERENT MIX!!!! AND THIS IS ALMOST IMPOSSIBLE TO FIND ON THIS LP!!!! THIS IS THE AMAZINGLY RARE '2.52' 1ST PRESSING OF THIS LP AND PLAYS THE ULTRA RARE '2.52' WITHDRAWN 'DEMO' VERSION OF 'TELL ME'!!! !THIS '2.52' MIX SHOULD NEVER HAVE BEEN ON THIS LP AT ALL (AS IT WAS NEVER APPROVED! ), ANDWAS IMMEDIATELY CHANGED TO THE STANDARD '4.06' PRESSING OF 'TELL ME' WHICH APPEARS ON ALLLATER PRESSINGS!!! !ONLY AN ABSOLUTELY TINY HANDFUL OF THESE LPs EVER LEAKED OUT WITH THE WRONG '2.52' VERSION - AND MAKE THIS, THE RAREST & MOST SOUGHT AFTER ROLLING STONES LP OF ALL TIME!!!! IT IS ALSO VERY IMPORTANT TO NOTE THAT ON THIS 1ST PRESSING - THE '2.52' VERSION OF 'TELL ME' IS NOT ONLY SHORTER THAN THE STANDARD LATER '4.06' VERSION - BUT ALSO ATOTALLY DIFFERENT RECORDING!!!! IT SOUNDS TOTALLY DIFFERENT (AND IN MY OPINION FARBETTER!) AND IS A SUPERB EXAMPLE OF THE ROLLING STONES AT THEIR VERY BEST!!!! AND OF COURSE, YOU DONT NEED TO TAKE MY WORD FORIT THAT THIS LP DOES INDEED HAVE THE ULTRA RARE '2.52' OF 'TELL ME', BECAUSE IF YOU TAKE A LOOK ATMY VERY CLEAR PICTURES BELOW - YOU CAN CLEARLY SEE A PICTURE OF THE 'XARL 6272-1A' MONO MATRIX NUMBER (ON THE 'TELL ME' SIDE OF THE LP!) INDICATING THE WITHDRAWN '2.52' RECORDING OF 'TELL ME', AND I HAVE ALSO TAKEN A PICTURE OF THE 'GROOVE SPACING' ON THAT SIDE OF THE RECORD - WHICH LOOKS COMPLETELY DIFFERENT TO THE NORMAL VERSION!!!! YOU CAN IMMEDIATELY NOTICE THAT 'BAND 3' (TRACK 3 'TELL ME'!) IN THE GROOVES - IS MUCH MUCH THINNER ON THIS 'WITHDRAWN' VERSION - WHEREAS ON THE NORMAL VERSION IT IS MUCH WIDER!!!! THISLP IS OF THE UTMOST RARITY - ANDALMOST IMPOSSIBLE TO FIND LIKE THIS, AND I AM VERY CERTAIN INDEED, THAT IT WILL BE A VERY VERY LONG TIME (IF EVER!) BEFORE YOU GET THE CHANCE TO OWN AN ULTRA RARE '2.52' 1ST PRESSING OF THIS INCREDIBLE LP AGAIN!!!! NOT ONLY THAT BUT THIS LP IS IN GREAT CONDITION - AND IS A VERY DECENT EXAMPLE INDEED!!!! JUST TAKE A LOOK AT THE PICTURES!!! !THIS IS THE ORIGINAL 1964 UK MONO '2.52' 1ST PRESSING ON THE 1ST PRESS UNBOXED 'GROOVED' DECCA LABEL, 1ST PRESS 'XARL 6272-1A' SIDE 2 MATRIX ENDING (INDICATING THE WRONG '2.52' VERSION OF 'TELL ME'! ), 1ST PRESS 'HANDLING/PLAYING' INNER SLEEVE, AND 1ST PRESS 'MacNEILL' FLIPBACK LAMINATED COVER!!!! THIS LP IS SERIOUSLY RARE AND VIRTUALLY IMPOSSIBLE TO FIND LIKE THIS - SO DONT MISS OUT ON THIS AMAZING OPPORTUNITY!!!! 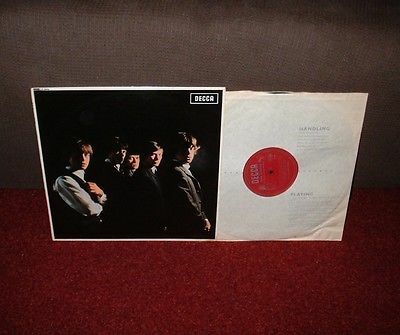 This is the ORIGINALDecca UK'2.52' 1st Pressing from 1964 and is in GREAT condition!!!! The record is pressed on THICK quality vinyl. The Cat. No is LK 4605on the ORIGINAL1st Press UNBOXED 'Grooved' Decca Label (see picture) and is aUK MONO 1st Pressing!!!! The record labels are in SUPERB condition (see pictures) with NO wear, NO writing, and only some spindle markings to either label!!!! The vinyl is in GREAT condition!!!! Most of these 60s LPs had been to a lot of wild parties and are usually found totally worn out, and almost unplayable. This one is NOT and has NO scratches, only a few VERY light hairlines, only 2 or 3 MEGA light scufflines, and only a VERYfew of the lightestpaper scuffs only visible under light!!!! There is also a very VERY faint 'shine' to the record (only when angled under VERY bright light ONLY!) which leads me to suspect that this record may have been cleaned in some way by a previous owner. THE RECORD IS STILL VERY BRIGHT & SHINY LOOKING INDEED!!!! It is alsogreat to find that the record plays as STUNNINGLYas the visual with NO skips, only a few VERY light clicks (though mostly NONE! ), NO sticking, only some VERY minor distortion in places, NO jumps, and barely ANY crackle AT ALL!!!! The record must grade Very Good (PROPERLY graded, NOT trashed!) if notbetter - and is still a very VERY decent record indeed!!!! Believe me this record is NOT overgraded in ANY way!!!! I use STRICT RC grading standards - it is not in my interest not to!!!! Brillant!!!! The record alsocomes in its ORIGINAL 1st Press'Handling/Playing' inner sleeve which is in BRILLIANT condition!!! !The ORIGINAL 1st Press 'MacNeill' Flipback LaminatedCover is in GREAT condition!!!! The cover has NO edge wear, NO spinal wear, only VERY slight corner wear (NOT through the colour! ), NO rips, NO tears, only a few VERYlight creases(cover is VERY flat looking! ), VERY shiny laminate (apart from the usual VERY minor record impression! ), NO splits, NO annotations, and NO writing!!!! The opening edge isbeautifully straight with barely ANY feathering AT ALL!!!! Even the unlaminated back of the coveris in BRILLIANT condition with NO yellowing, NO grubbyness,NO ringwear, barely ANY rubbing AT ALL, andNO writing!!!! Thecover must gradeVery Good+ if not better!!!! THERE IS ABSOLUTELY NO DOUBTAT ALL, THAT THIS IS ONE OF THE ALL TIME RAREST ROLLING STONES LPs ANYWHERE IN THE WORLD TODAY (WITH THE WITHDRAWN '2.52' WRONG VERSION OF 'TELL ME'!)!!!! THISLP IS SERIOUSLY RARE AND VIRTUALLY IMPOSSIBLE TO LOCATE - SO DONT MISS OUT ON THIS INCREDIBLE OPPORTUNITY!!!! HAVE A LOOK AT MY PICTURES - I DO MY BEST TO SHOW THE RECORD FROM ALL ANGLES AND MAKE THE PICTURES AS CLEAR AS POSSIBLE - THERE IS NOTHING TO HIDE!!!! It really is a GREAT looking LP and it is truly rare to find any copies of this MEGA RARE LP!!!! THIS WILL BE YOUR ONLY CHANCE TO BUY AN ORIGINAL 1964 UK'2.52' 1ST PRESSING OF "THE ROLLING STONES" BY THE ROLLING STONES, IN GREAT CONDITION!!!! Dontforgetto take a look at allmy other items including many other TOP LPs and contact me with any queries you may have. Postal discounts for multiple buys are always available - and I guarantee to ALWAYS undercharge on postage! Paypal, Bank Transfers, Cheques, International Money Orders, and Postal Orders accepted. Thanks for looking! Cheers!!!!! PLEASE NOTE - I may be called in for an operation on Monday should the opening arise. If so, there maybe a slight delay of sending of up to a week (but clearly it is likely to be far shorter as recovery times are thankfully quicker in this day and age). Of course, I will still be contactable even in the hospital bed. I will also schedule more auctions in advance anyway, so there will still be something to look at next week! PLEASE NOTE!!!! I AM NOT IN HOSPITAL ON MONDAY AND SENDING WILLBE AS NORMAL!!!! THAT IS AN OLD MESSAGE - AND I FORGOT TO REMOVE IT!!!! After questions - please note that the 'Tell Me' side does have the ALL IMPORTANT '1A' matrix indicating the WITHDRAWN 'Demo' 2.52 mix of 'Tell Me'!!!! The other side (which is completely unimportant as the mix was never changed on that side!) is 2a. Of course, as I just mentioned, that side isnt important at all - as the mix was only ever changed on the 'Tell Me' side ONLY - which has the EARLIEST & RAREST 1st Press 1a matrix!!!! Which is why the official and definitive UK RECORD COLLECTOR 'Rare Record Price Guide 2016' states:- "64 Decca LK 4605 ROLLING STONES (1st Pressing. plays 2.52 version of "Tell Me"; Side 2 matrix XARL 6272-1A)" Which is EXACTLY what this has! It has the 1ST PRESS ONLY 'XARL 6272-1A' Side 2 matrix (the 'Tell Me' side!) - clearly showing that this LP plays the ULTRA RARE and WITHDRAWN 2.52 'Demo' mix of 'Tell Me'. WHICH IS EXACTLY WHAT MAKES THIS LP SO VERY RARE AND SOUGHT AFTER!!! !